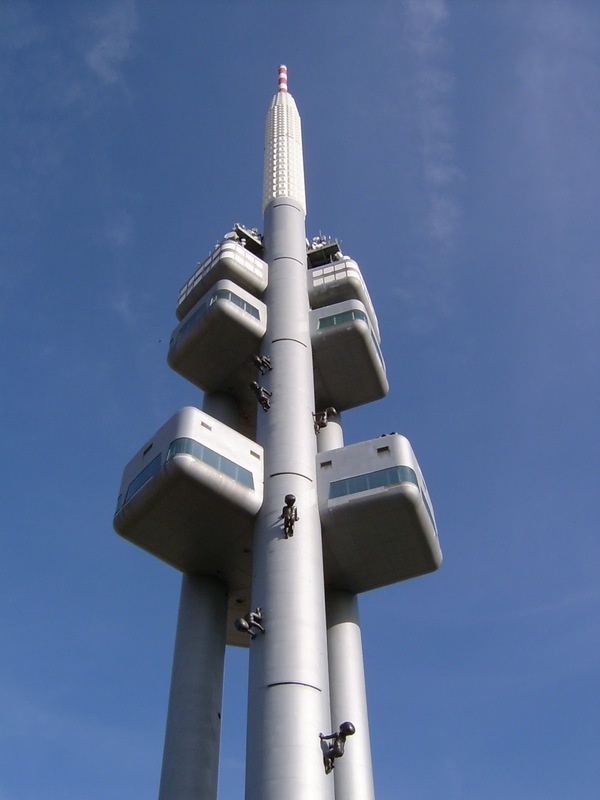 The Zizkov Television Tower is one of those unique transmitter tower built between 1984 -89 in Prague. It was designed by the architect Vaclac Aulicky and the structural engineer Jiri Kozak and stands high above the city’s traditional skyline from its perch on top of a hill in the district of Zizkov from where it derives its name. It is an example of the high-tech architecture. It provides the devices for transforming TV signal covering a huge territory and also offers three cabins at a height of 93 meters together with a restaurant providing an amazing view of the city at a height of 66 meters. Objects at the distance of 100 kilometres can be viewed in a good weather. The structure of the tower seems to be unconventional which is based on a triangle with the corners up in steel columns, comprising of three tubes with a double steel wall that are filled up with concrete. These support the nine pods as well as the three decks for the purpose of transmitting equipment. Out of the three pillars, one tends to spread significantly higher than the rest providing the necessary height for some antennas together with the structure’s rocket and scaffold appearance. The tower stands at 216 metres high and during its time, it was a unique technology which was patented by the authors.Three pods are positioned immediately beneath the decks towards the top of the tower and are utilised for equipment linked to the tower’s main function and are not accessible to the public. The remaining six pods are kept open to visitors, the highest of which are observations rooms at a height of 100 metres. This provides an amazing view of Prague together with the surrounding area. The lower three, about half way up the length of the pillars at 63 meters accommodate a refurbished restaurant and café bar. The elevators have been equipped with speedometers, which tend to transport passengers to the various levels at a rate of 4 m/s. The weight of the tower is around 11,800 tons and is utilised as a meteorological observatory and is also a member of the world Federation of Great Tower. The Zizkov Television tower is the highest construction in Prague and also the highest tower in the Czech Republic of about 260 meters. The parking area beneath the tower has been designed to accommodate about 70 cars. Another amazing thing about the tower is that 10 huge babies have been created by sculptor David Cerny that seems to be climbing the tower. They had been put on the tower for the first time on 29th May 2000 and became very popular. Zizkov Tower or Park Tower Praha as it has been rebranded, has been the subject of great admiration for long and has been included by some as a Czech national treasure and rejected by others as conflicting and aggressively innovative eye sore in a city which is dominated by marvellously preserved historic architecture. A high ranking principal on `ugliest buildings in the world’ lists, public opinions has warmed to the high edifice since 2000 when the Czech sculptor and David Cerny released 10 giant fiberglass babies on its pillars. These were meant as a temporary installation but the babies were so beloved that they remained fixed to the tower and became famous. Zizkov Tower doubles as a transmitter as well as an observation tower offering awe-inspiring views from its public observatory.